Are turbos and training apps making Irish race crashes more likely? New training methods have made Irish amateur riders, in races and sportives, stronger than ever. However, with many using home trainers and apps to hone their strength, is safety being compromise? With the sportive and racing sectors of Irish cycling continuing to boom; our cyclists are fitter and stronger than ever. And because the average strength and condition has increased with better training methods, speeds are also rising. However, with a generation of cyclists now getting many of their miles in on home trainers and using apps such as Swift and Strava, are cyclists losing touch with the reality of riding hard in a group? When cyclists switch from the predictable and safe home trainer, will they be able for the chaos and movement in the bunch in spring? If not, are more crash inevitable? 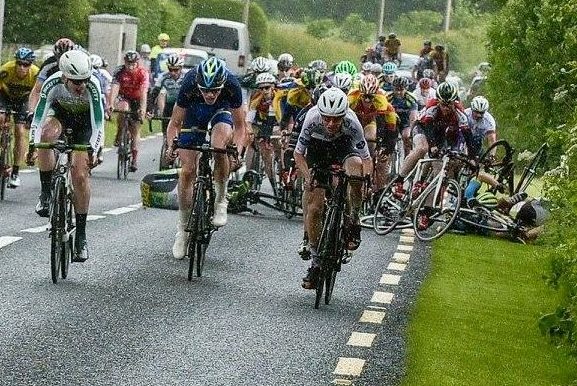 This year to be the worst year ever for bicycle crashes in Irish events? It’s a bold statement but I believe it’s pretty realistic. You might ask why. There are a few reasons. The past 12 months has seen a huge increase in people investing in smart trainers and indoor systems. The likes of Zwift and virtual training apps mean it’s now easier than ever to train inside. Everyone has been getting fitter and stronger since the speed ran out of the Celtic Tiger and people are perhaps a bit less focused on work. These days everyone worth their salt is talking about their FTP, Lactate power, max Watts and so on. Chris Froome and the rest of the professionals are talking about numbers; causing the rest of us, irrespective of ability and experience, to focus on our own data. In cycling it’s now more about ‘the numbers’ than ever before. It means riders are now stronger than ever; with races and sportives in Ireland more populated by stronger riders than they’ve ever been, pushing the pace ever higher. So it’s highly likely, I’d say a foregone conclusion, that sportives and races will continue to get faster. But will they be safer? The A1 riders who have come through a system of domestic racing will be able to handle themselves. Most have honed their bike handling skills as they have progressed through the ranks. But when we look down through the racing categories, and indeed to sportives, there is more cause for concern. Newer riders can jump into cycling, often from other sports. As they improve their FTP scores and take a few crowns or PBs on Strava – many have completed a lot of their training indoors. But as their numbers get better, their expectations of the results they may achieve on the open roads tend to rocket skywards. A word of warning; the thing about virtual reality cycling apps is – they’re not the real thing. They feel real in terms of intensity of effort and the screens make it look real. But when it comes to the nitty gritty of riding in a group, especially racing; it’s as far away from the real thing as Xbox. When it comes to bike racing; technical skill, tactics and peripheral vision awareness are as important as being physically prepared. The World Cyclocross Championships in Denmark showed what’s required to be competitive in terms of skill and bike handling. Riders from Holland and Belgium have led the way, but the British are really closing the gap. In Ireland cyclocross has grown and I believe it’s the way forward for youth development. We have seen again and again that there is crossover from off-road onto the road. Riders like Sagan, Van Aert, Vos, Evans and Van der Poel have all made the switch and their bike handling has really helped. On home roads, Chris McGlinchey was a top downhill rider before taking up road racing. Now a Continental team rider, we’ve seen his bike handling really come to the fore several times. He excelled at Rás Mumhan a couple of years ago; really impressing on descents where he proved more capable than our other top riders in closing gaps and being able to open them. These days, many of our cyclists do a lot of their winter endurance rides at a high average speed – 28-35kph per hour – and much of it indoors. And then they jump into a bunch or large group. Suddenly they have to handle their bikes in packed fields doing speeds well in excess of 50kph. And they’re probably doing it going down back roads to boot. Have you trained technically to do this? Having the ability to manoeuvre a bike at speed in a bunch is a skill that can easily be honed when in your early teens. But it is extremely hard to develop when you start racing in your 40s. The biggest national championships field in 2018 was the Masters 40 road race. And the biggest open road races are A3 events. Crashes happen more often, though not exclusively, at A4 level. The bottom line is that we, as cyclists, all have a responsibility to be respectful and careful when racing or riding sportives. We only do it as a hobby pastime. The reward doesn’t even cover our yearly entry fees. So why take unnecessary chances, especially when you don’t have the skill level? The four fundamental skills of learning to ride are balance, pedaling, braking and cornering. The one everyone practices is pedaling and the rest are honed…. Whenever. I know riders who plan to race this year and who are really strong but can’t clip in, take a drink or change gear without looking down. Take that a step further; they’re also poor at descending, taking a corner and have zero awareness skills. They hate for anyone to ride close to them or, worse still, can’t handle other riders to even brush against them without freaking out or wobbling. And some of them barely have the ability to take a hand off the handlebars to feed themselves on the move. So you can’t expect a single hand gesture from them signaling a change in direction or as warning of an obstacle ahead; like a pothole or road furniture. To me this all spells trouble. Big speed in a big bunch means that at some stage a big crash with big injuries is inevitable for some of these riders. If you are strong enough, then get out of the bunch and go up the road before all hell breaks loose. But if you are not; stay safe, mind yourself and focus on staying out of trouble. What can we do before this season? First and foremost make sure you can do the four fundamentals outlined above at speed; balance, pedaling, braking and cornering. Practice in a car park or a quiet industrial estate. Continually look to improve yourself when it comes to these so-called basics. Learn how to bunny hop, rub a wheel, swerve and try advanced movements by moving around in a group. Train with recognised racing cyclists in their group session. Do a reliability trial, most of which are in the North. If possible, do some motor pacing behind a moped. Or watch another experienced rider doing the same. It will simulate a scenario that puts you under pressure on the open road; rather than on the predictable and static home trainer. If none of the above is available to you, then go to the first few races or sportives purely to learn the trade. Observe what’s going on. Look out for the bad bike handlers. Note what they are doing wrong and make sure you don’t do the same. Look for the experienced riders; the ones you know because you see them in the race reports winning races. Take your lead from what they do on the bike. Feel how events speed up and slow down. Make a note of it, get comfortable with it. A group of cyclists constantly changes shape moving along the road; know that, and get comfortable with that idea and with the motion of it. Try to relax but be attentive; stay to the outside of the bunch where there is room to escape a crash or incident. The season is long, there are loads of races and sportives and if you are good enough your time will come. It’s OK to spend a very long chunk of the early season getting the feel of the movement in the bunch. Once you get a fix on that and you’re comfortable with it you’ll have plenty of time to have an impact on races. And if you’re comfortable moving around you’ll have a much better chance of being able to influence them. Here’s hoping I’m wrong with the opening line I’ve selected for this piece. But be aware that you won’t learn how to handle a bike on a home trainer or by using an app. These new devices and training methods are great. But they are not road riding and while they will help you get stronger; strength is only one of the tools you need. Bike handling is absolutely crucial and the only place you’ll learn that is on the road and in a group. Skip that stage of the learning process at your peril….